Invited to the Health and Care Innovation Expo 2016 at Manchester Central on 7th & 8th September by The AHSN Network we joined the AHSN Innovator Zone to showcase this unique, Simple Telehealth system with a Human Touch. The Simple Shared Healthcare Team were out in force spreading the word about how the Simple Telehealth methodology can be used to enhance patient’s lives. The exhibition was hosted by NHS England to ‘embrace innovation’ and to see if 'technology can provide a better way of delivering the service’ the NHS currently supplies. There were a wide variety of technologies and innovations represented, with many areas hosting talks and presentations and the exhibition was busy with delegates on both days. The AHSN Network stand had a large main section with a presentation area and a series of pods for their innovators to demonstrate evidence based technologies. Day one of the AHSN’s presentation program was kicked off with by Phil O’Connell, the inventor of Flo, talking about how Flo helps improve patients’ lives and the excellent relationship with the ASHN network that has been built up over the last few years and continues to grow, now focussing on spread and sustainability. 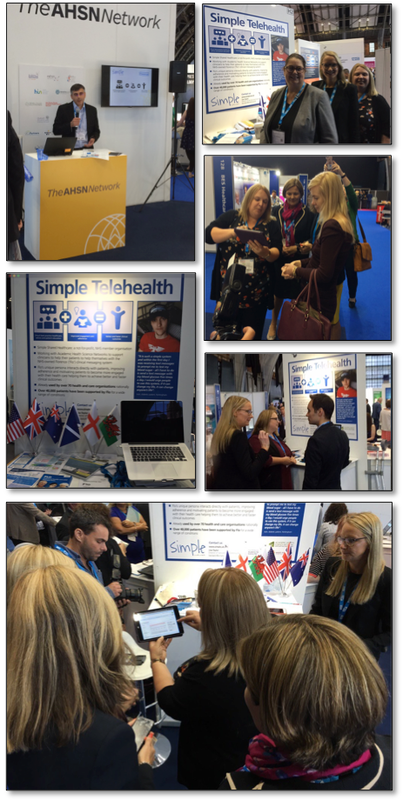 The Simple Telehealth pod was busy on both days with enquiries from delegates from a wide range of backgrounds, all eager to learn how Flo could help them. The flags on the stand, highlighting the national and international nature of Flo’s current use, were a great draw as delegates from all over the world were visiting and intrigued to hear what was happening in their area. Delegates visiting the stand enjoyed live demonstrations of Flo in action and learned about the wonderful success stories from our member community. There were a number of high profile visitors to the exhibition. Jeremy Hunt, Secretary of State for Health visited on Wednesday and Nicola Blackwood, Parliamentary Under-Secretary of State for Public Health and Innovation in the Department of Health, attended on Thursday and popped into the Simple Telehealth pod. Nicola was given a live demonstration by Karen Moore and was impressed by how quick and easy it is to set up and how it's being used by patients to improve their motivation, engagement and adherence to shared healthcare plans. Ruby Wax joined the panel on the Innovate Stage to lead a discussion on mindfulness and mental health. This was very well attended and received. Overall the two days were an informative and enjoyable experience, helping to better educate people about the availability of technology to improve patients’ lives for the future.